Jurgen Klopp has welcomed the return of Virgil van Dijk and Xherdan Shaqiri, as he faces tough decisions over his lineup for Liverpool’s trip to Man United. Van Dijk missed Tuesday night’s 0-0 draw with Bayern Munich due to suspension, but will be raring to go for a must-win Premier League clash at Old Trafford. The Dutchman is a certainty to reclaim his role at the back, and is likely to partner Joel Matip as Fabinho returns to the pool of top-class midfielders at Klopp’s disposal. Gini Wijnaldum, Naby Keita and Jordan Henderson can all lay claim to a starting spot in the middle of the park, while Shaqiri is also back from an abdominal injury, giving the manager another option to consider. Speaking at Melwood on Friday, Klopp expressed his delight at the improving fitness of his squad, though Dejan Lovren and Joe Gomez are still out and Alex Oxlade-Chamberlain and Rhian Brewster won’t be involved either. “It’s really good to have him back,” he said, deflecting the narrative of Van Dijk being his new ‘colossus’, with one reporter pushing for a comparison with Ron Yeats. “By the way, it’s the first time since I don’t know how many weeks that we have to make a choice. “Between midfielders, full-backs, even centre-halves if I think about Fabinho again in that position, I could make a decision about it. “So that’s good. That’s for us a good moment, so far this week obviously because of the Bayern it was more or less a recovery. Klopp’s injury update provided little in terms of new information, having already ruled out Lovren before the Bayern game and with Gomez still recovering after surgery. 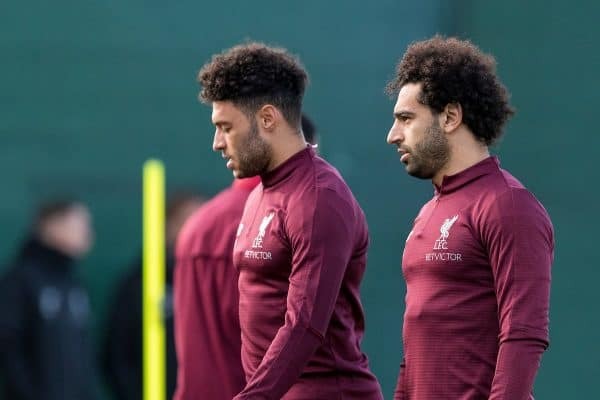 The most positive factor in his assessment on Friday was that Oxlade-Chamberlain is now working in “bigger parts” of training, though he added that the No. 21 is “not ready to play,” as expected. “Dejan not in, Joe not in, I think pretty much all the rest are in training at least,” he continued. “Rhian Brewster is still only [doing] little parts, Ox in bigger parts, but not ready to play. “The rest trained and will train with us. Van Dijk, Wijnaldum, Fabinho, James Milner and Roberto Firmino have all struggled with illness in recent weeks, but the hope is that there will be no withdrawals from the squad ahead of Sunday. 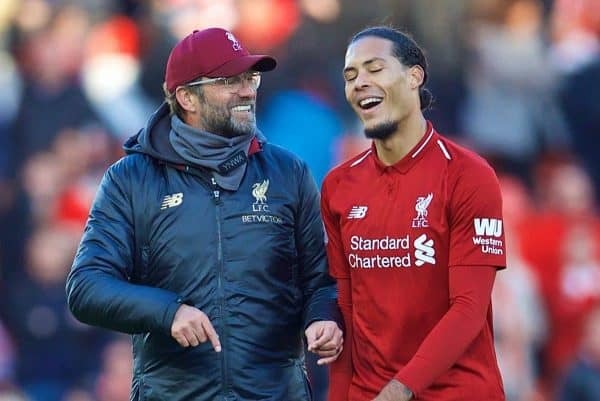 In fact, Klopp is now relishing the increased strength of his squad and the ‘good problem’ of leaving senior players out of the matchday squad. Of late, the likes of Curtis Jones and Rafa Camacho have been required to fill in on the substitutes’ bench due to injuries, but now it could be Alberto Moreno, Adam Lallana and Divock Origi who miss out instead. 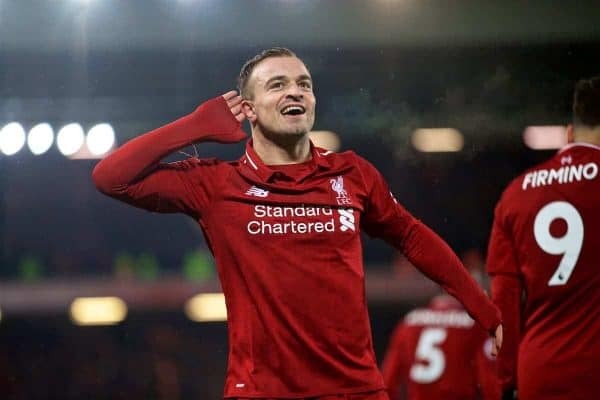 Perhaps the most useful candidate to bring on late on in games is Shaqiri, who scored twice to seal a 3-1 win over United at Anfield back in December. “It’s not difficult, now I have to make a decision about who starts for the first time,” Klopp explained. “We always had a good lineup to start. Our problem was how can we change [from the bench]? That’s a problem. “Maybe one or two players who are not 18 years old will not be in the squad. I don’t know in the moment, but that could happen. “That’s all good, we need that. We need to have influence from the bench, that we can change, bring on players who are fit and not like Shaq against Bayern, having one session. “Because of other things we thought if we need him for 10, 15 minutes we can bring him in at least. “Now he had another five or six days in training, that always helps. “That’s what you need in a very decisive period of the season. We created a basis, I said it a lot, we have to use it now. “To use the situation you need the right number of players, because we have three games in the week—I don’t think about the other games but I know they will come. “So it’s good. First time, and hopefully it stays like this, that we can make changes in the game, in the lineup, that’s what you need.